The product arrives in the mail with dents in the outside box. I was worried about what would be on the inside. I'm glad that the small dent in the packaging box isn't as bad as the outside box. Not sure what happen during the shipping. 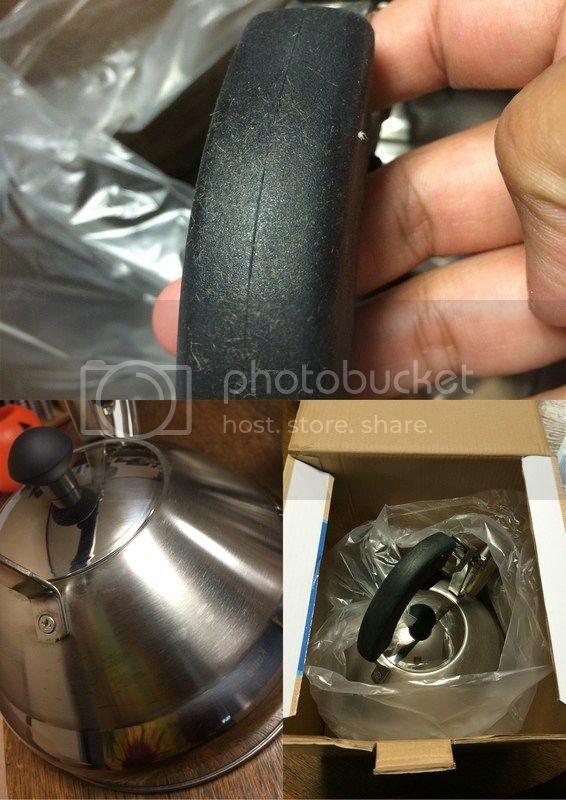 I opened the packaging box to see what my kettle would look like. I've noticed that it wasn't wrapped all the way, the plastic cover seems to be open 3/4 and the handle is exposed, in which I've seen some gooey in it. The stainless surface also has this darker spot that I don't know what it is, so I washed the kettle in the sink to make sure that all I've seen were only from the manufacturer's dirt. And after it was dry, I'm thankful that all those spots I've spotted were only dirt. Now the kettle looks astonishing and sparkly. The kettle holds up to 2.75 Quarts just enough to have a boiling water whenever I need to make my instant coffee or drink my tea. 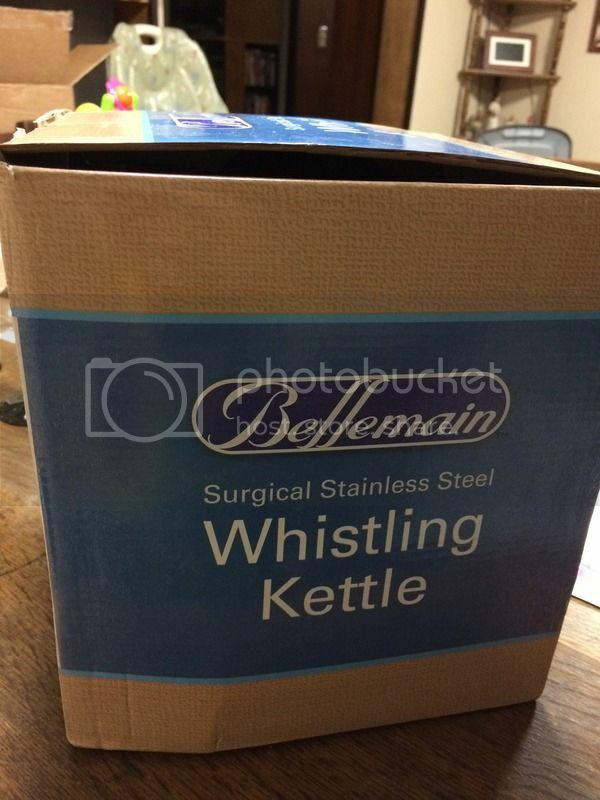 When it boils the whistling kettle doesn't sound like too loud, it has a soft whistle sound. I've waited for a minute hoping that it might whistle in a higher pitch but not. Since I was in the kitchen that time, I did hear it right away, I don't know if I will be in the other room. I took a video of the kettle while boiling in order for you to hear how loud the whistle, hoping that I don't have a problem with hearing. 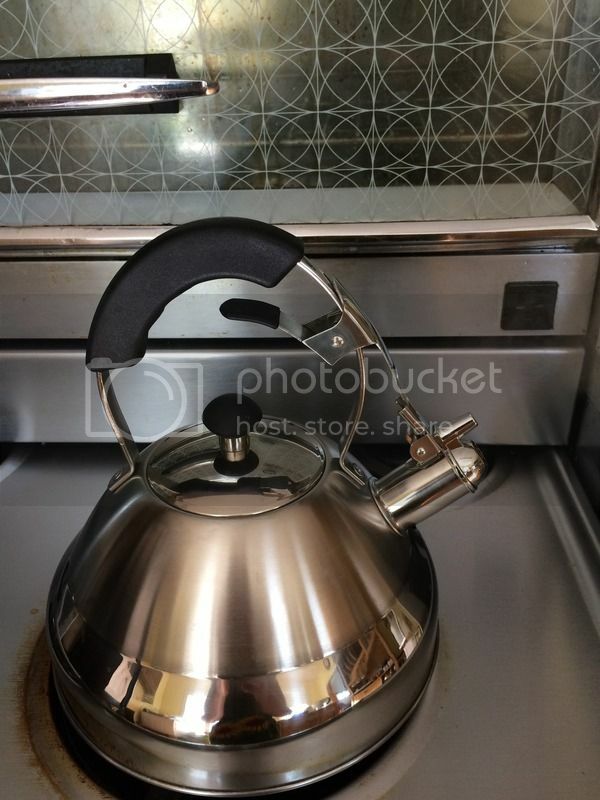 Easy to clean the kettle, it's shiny and I like it. Very light weight. The lid is also intact, and the handle is also good too, as the sure-grip handle helps cool the handle that I can hold the kettle without being burnt. Other than the way I received the product, I have no problem about the kettle. I am happy and satisfied with the product itself.